Jake Geppert is a musician who lives in Vermont. Covering a wide variety of styles Bluegrass, Acoustic rock , Irish, and Jamband. A prolific songwriter, he keeps it close to the ground with feeling and honesty. Jake was born and grew up in Ramsey, New Jersey. He played in the school band along with several rock groups in high school. His band “Paradox” won the talent show at Ramsey High in 1983. 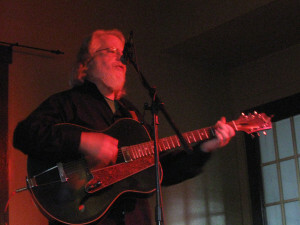 Jake discovered the Banjo and Bluegrass music from the band “Old & In The Way.” He completed one year at Bergan Community College in Paramus, New Jersey in 1984. There he studied music with instructors who came from Juliard School of Music. Jake then moved to Council Bluffs, Iowa in 1985 and recorded with the Bluegrass band “Shady Grove” in 1987. In 2001, Jake joined with the Rad/Trad Band, “Crazy Maggy” out of Newburyport, Massachusetts. He left Maggy in 2005 to continue playing with the Bondville Boys and pursue his singer/songwriter career. When Jake is not playing with The Bondville Boys he can be found playing solo, or with his duet band – Unified String Theory, with Gary Wade, or with the Buzzards, featuring long time musicians, Paul Biscayne, Tom Morris, Colin blaze and friends, at farmers markets, fairs, music, garlic and art festivals, taverns, private parties and weddings throughout Vermont, New York and New England. If you’re in Vermont during March, you can also find Jake playing with the awesome Irish band, Tommy Bone’s Thunderous Tones at the Red Fox Inn, for their annual St. Patty’s Day weekend. When Jake is not playing music, he teaches music lessons privately and at Burr & Burton Academy in Manchester, Vt. He is also currently listed on the Vermont Departent of Libraries Summer Reading Program, Performer Grant List for 2018 – Libraries Rock!